theruL uRRa – who have divine knowledge? aruLichcheyalai – the greatness of dhivya prabandhams that they divined? uNdO – whether there can be anyone else (who know the greatness of AzhvArs and AchAryas). In the previous pAsuram as he divined that those who do not know the greatness of distinguished pramANams (dhivya prabandhams), and its authors (AzhvArs) are to be given up, it is established that only those who know the greatness of these are the only ones to be regarded. So when asked – who are those that are to be regarded, he (maNavALa mAmunigaL) replied – is there anybody else – it is our nAthamunigAL and other AchAryas. Ones in the previous pAsuram and the ones in this pAsuram are like those who abuse and praise respectively. 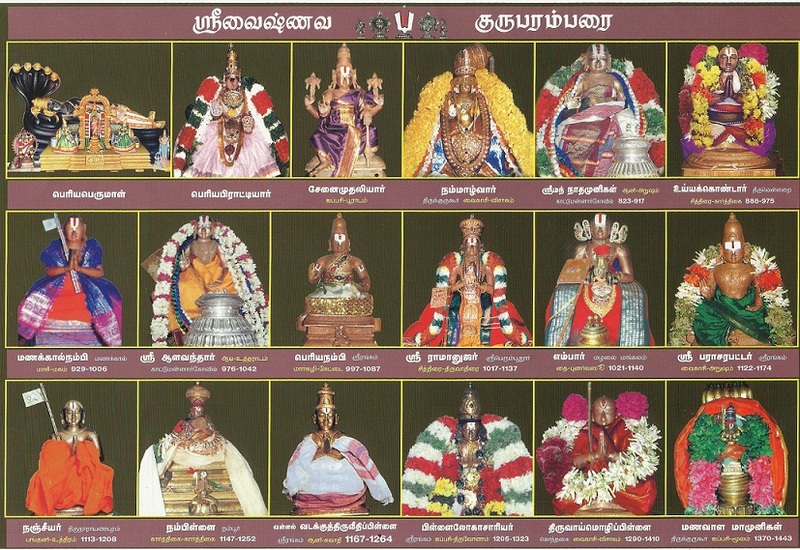 theruL uRRa AzhvArgaL seermai aRivAr Ar – Since they are same in getting divined the unblemished knowledge (mayarvaRa mathi nalam (thiruvAimozhi 1.1.1)), being ‘theruL uRRa AzhvArgaL’ (AzhvArs having divine knowledge) is being their identity. – while others are after artha (objects/wealth), kAma (desires), and having ignorance/in the dark, and live around like mad/drunk, these (AzhvArs) do not have any trace of darkness (in mind) as said in ‘maruL il … vaN satakOpan [thiruvAimozhi 2.10.11]’, and by that strength search for the bright mOksham, and get to SrIvaikuNtam. In AzhvArs’ case aren’t they full of knowledge about the five things that one should know (artha panchakam). theruL uRRa – is – being rooted in that (the aforementioned). In this way they are being like ‘nAttArOdu iyalvu ozhindhu nAraNanai nANNi [thiruvAimozhi 10.6.2]’ (gave up interaction with the people and got SrIman nArAyaNan). seermai – is – Compared to those who have got the knowledge of AthmA, AzhvArs are better like the difference between an atom and a mountain (parvatha paramANuvOttai vAsi), and having the greatness of having distinguished birth/life, activities (vruththam), and knowledge. That is, the greatness explained in ‘AzhvArgaL ERRam [updhESa raththina mAlai – 34]’. In the vyAkyAnam of ‘thirumanthraththinudaiya seermaikkup pOrumpadi [mumkshuppadi – 3]’, it was divined as ‘gauravam’ (dignity). 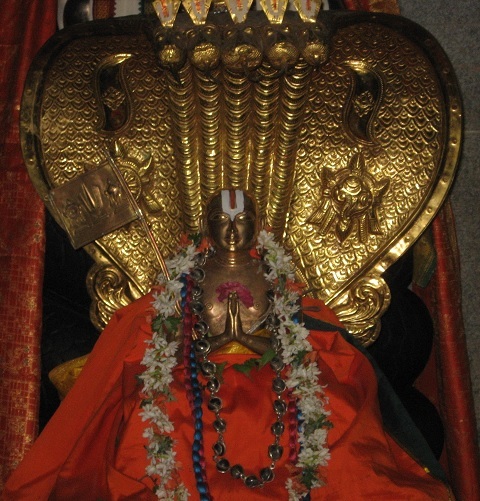 nAyanar (azhagiya maNavALap perumAL nAyanAr) also divined ‘idhukku mUlam … patta pOdhu ezhu pOdhu aRiyAdhirundha prabhAvam [AchArya hrudhayam – 93]’ (describes about the greatness of AzhvAr). AzhvArs’ greatness is as said in ‘viNNuLArilum seeriyar [thiruviruththam – 79]’ ((those who are always worshipping emperumAn) are greater than those in the other worlds), and ‘pErALan pErOdhum periyOr [periya thirumozhi 7.4.4]’ (mahAthmAs who recite the divine names of the One having greatness) , and ‘mikka seerth thoNdar [periya thirumozhi 11.1.9]’ (SrIvaishNavas who are ananyaprayOjanars (not expecting any other benefit from him)). Or, considering the phrase ‘theruLuRRa AzhvArgaL seermai’ as being theruLuRRa is their seermai (being given divine knowledge is their greatness). He (maNavALa mAmunigaL) is saying that except those whom he is going to list, who would know the greatness of the aforementioned. AzhvArgaL seermai aRivAr Ar – Are those who do not by habit distinguish between dhEham (body / prakruthi) and AthmA, going to go to the level of those who have understood the glory of their (AzhvArs’) divine knowledge, in order to know their (AzhvArs’) greatness? aRivAr Ar – Or are the unfavorable (prathikUlar) who think that dhEham is Athma, going to be able to know the greatness of AzhvArs who are favourable (anukUlar). So, he is saying ‘aRivArAr’ sounding like it is rare (to find who know the greatness). Furthermore, who would know the greatness of the prabandhams that are authored by the AzhvArs which convey the meaning of prapaththi? aruLichcheyalai aRivAr Ar – Who would understand the greatness of its meanings and welcome and inculcate their divine verses that are dhivya prabandhams? The word ‘seermai’ (greatness) is to be applied to this phrase also from previous phrase – it was divined as ‘AzhvArgaL ERRam aruLich cheyal ERRam [upadhESa raththina mAlai – 34]’ only isn’t it (thus greatness is applicable to both). When understanding the greatness of prabandham phrases like ‘theruL koLLach chonna Or Ayiraththu [thiruvAimozhi 2.10.11]’ (~ among the one thousand pAsurams said with divine knowledge), and such, it would imply that AzhvArs have been graced, isn’t it? Would those who attend to pleasuring words based on their svAthanthriyam (feeling independent from emperumAn), celebrate the dhivya prabandhams of limitless enjoyment by understanding that the prabandhams are part of gaining their svarUpam (true nature)? The limitless enjoyment is as said like in ‘pAlOdu amudhu enRa Ayiram [thiruvAimozhi 8.6.11]’ (~ among the one thousand pAsurams that are enjoyable like the mix of milk and food), and ‘thoNdarkku amudhu [thiruvAimozhi 9.9.10]’ ((said this thiruvAimozhi) as nectar for devotees) , and ‘sencholAl eduththa dheiva nanmAlai [periya thirumozhi 1.1.10]’ (divine garland made of beautiful words). 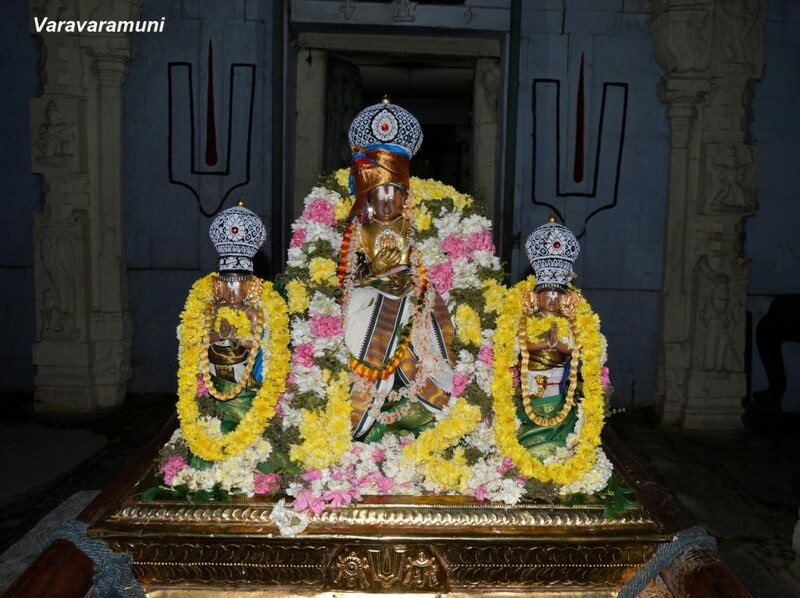 It is part of gaining svarUpam is as said like in ‘paththarAgak kUdum payilumin [thiruvAimozhi 3.6.11]’ (can become devotees so practice (this decad of thiruvAimozhi)), and ‘uriya thoNdar Akkum [thiruvAimozhi 6.9.11]’ ((those who learn this decad) it would make them ananyArha SEshabhUthar (subservient to Him only)). In these, maNavALa mAmunigaL understands the meaning of AzhvArs, and explain to us. aruL peRRa nAthamuni mudhalA(m) nam thEsikarai allAl – They are – starting from nAthamuni who got the grace of ‘aruL mARan’, they are in the seat of AchAryan, and enriching the dhivya prabandhams with their passion – they are: the AchAryas shown in ‘nAtham pankajanEthra … dhEvAdhipAth [bhagavath vishayam thaniyans]’ (nAthamunigaL uyyakkOndAr … dhEvarAjar (nAlUrAchchAn piLLai)). ((up to) nam dhEsikar) – His (maNavALa mAmunigaL’s) dhEsikar (AchAryan) is thirumalai AzhvAr (thiruvAimozhip piLLai), as said in ‘dhEvap perumAL kaik koNdaruLum thirumalai AzhvAr’ (thirumalai AzhvAr who is graced by dhEvap perumAL). He (maNavALa mAmunigaL) is saying ‘nam’ dhEsikar due to his state of devotion (towards his AchAryan / AchAryas). aruL peRRa nAthamuni – aruL – grace; nAthamunigaL got the grace of AzhvAr (nammAzhvAr), as well as the grace of mannanAr (emperumAn at kAttumannAr kOyil where he performed kainkaryam). Only those who are the targets of grace of bhagavath and bhAgavathas would understand the greatness of AzhvArs and the greatness of dhivya prabandhams and live, isn’t it? Is it possible for others to understand? pEdhai manamE uNdO pEsu – Oh young mind! Is there anyone other than these able ones? Try to say and see if possible. There is no such meaning. So, he says no one occurs to the mind. By this, it says that what cannot be known with own efforts, would be known without any effort for those who are graced (by emperumAn and His devotees). This entry was posted in Other, upadhESa raththina mAlai and tagged 74, achan, acharyas, annan, arulicheyal, azhagiya, azhvars, erumbi, erumbiappa, hrudayam, hrudhayam, kovil, mamunigal, manavala, nAdhamunigaL, nAthamunigaL, nayanar, nayanarachan, pasurams, peruamal, pillai, rathina, rathinamalai, raththina, raththinamalai, upadesa, upadhesa, uyyakkoNdAr on January 7, 2016 by raghuram.